I admit to a strong bias when it comes to Rome. 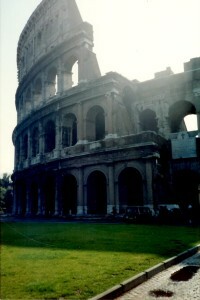 Excepting cities I resided in, Rome is the city I know best. It is partially because of the trip I’m writing about, but mainly because I wrote a mystery set there. Google Earth is a tool this author cannot do without. That said, most of the sites in the book I saw only on a computer. Instead of revisiting what was familiar, I set out for new ground. Besides, memory is not a reliable narrator, as I found out. The Colosseum, Rome, Italy. A van parked near the base provides some scale. Thanks to Ridley Scott many people have a better idea of the size of the Colosseum. The digital reproduction in Gladiator was amazing. No such re-creation was available in 1990. There was little to prepare us. It was, after all, built in the 1st Century AD. A reasonable mind wouldn’t expect the reality of the Colosseum. My most recent stadium experience at the time was the old RCA/Hoosier Dome, with a seating capacity of just over 60,000. The Colosseum, in contrast, had an average attendance of 65,000, with a larger maximum capacity some sources say. The Romans had a secret for mixing concrete: they used volcanic ash. In fact, they were particular about which ash was used. The resulting product is weaker than modern concrete, yet more resistant to deterioration. I learned this just a few years ago while researching my book. This is how some of their structures remain intact after two millennia. We set out from our hotel early. The Colosseum was a short walk. We turned the corner a half block from our hotel’s entrance and there it was, just a few blocks further. Time has not always been kind to Rome. The city lost much of its population after the collapse of its empire. Dust and debris piled up to the point where many of the landmarks of ancient Rome were buried. Because of this, our first view of the stadium was deceptive. The “aura” effect is present here again. 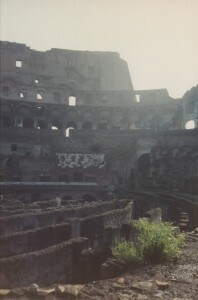 Interior of the Colosseum as it was in 1990. The ground around the base of the Colosseum is around fifteen to twenty feet lower than modern Rome. In other words, the first glimpse (link to a photo on Wikipedia) we had of the structure was about two stories shorter than it’s actual size. When we came close enough to realize this, I was in awe. To continue the earlier comparison, my eyes told me it was at least as big as the RCA Dome, and probably larger. This was one of the things I recall telling people over and over after the trip. Our guide Giovanna was probably relaying great information, but I was busy processing the information from my senses. I do remember her talking about the brick structures, visible in my photo at left, used to shore up the outer walls. Much of this preservation was led by the Vatican and large stone plaques (one is also visible in the photo) are placed in various spots around the structure to commemorate the efforts of particular Popes. It was a spectacular morning. A thin cloud layer had not yet dissipated and its effect on the light of the sun is apparent in my photos. The layer diffused the light of the sun to create the aura effect you see. It was something I barely appreciated at the time, but certainly do now. Please click on the photos to get a better look. 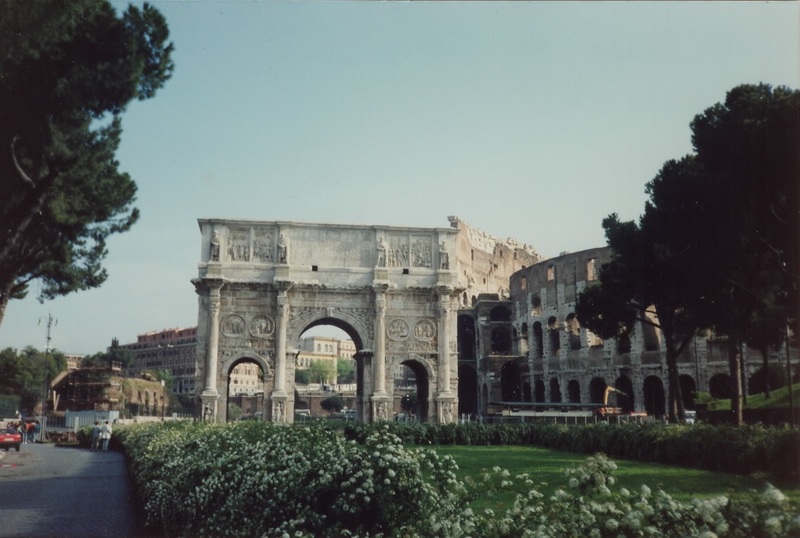 The Arch of Constantine…NOT a ticket office for the Colosseum (visible in the background). Memory is a tricky thing. I am certain our group was told this: “Every stadium has a ticket office and the Colosseum was no exception.” The moment I heard this we were in the grounds around the Colosseum and my attention was on the Arch of Constantine. Whether the rest of my group was looking the same direction, I don’t know, but for years I thought our guide meant the arch was the Colosseum ticket office. I told people this when they looked at my photos. It is much easier today to research such things. Sigh. The Roman Forum – Write It Down! The area at the base of Capitoline Hill is generally referred to as the Forum, but there are many structures there. It was once the center of Roman civic life and there are a number of temples as well. All in all, it is a compelling location for a tourist. And…I have little memory of our walk to it or partially through it. I can’t tell you which! There is evidence I was there, though. The photo at right and below is the Temple of Castor and Pollux. The angle this is taken from suggests we were right down on the lowest level of the Forum grounds. I have no recollection of this, nor of taking this photo. 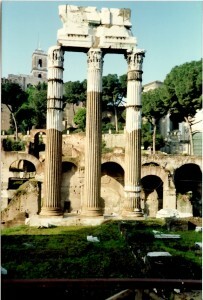 Temple of Castor and Pollux, Rome. I have only a vague memory of taking this photo. What I do remember is walking along a small side street packed with parked cars, mostly Alfa Romeos. Whatever we were looking at was on our right and below us. We came to corner that overlooked many ruins and this where I shot the photo of the Temple. Or so I believe. Looking at a map of Rome today and using Google Earth, it is impossible to reconcile my memory with the physical reality unless the street I was standing on was excavated in the last 26 years. What I’m saying is if you want to remember something, write it down! It is surprising how much I remember given the time span between this trip and now, but there are a few blank spots too. I will return to Rome and gather new memories, but return a third time? I doubt it, even though I could spend years, there is too much in the rest of the world I want to see! So…next time I’m bringing a journal. Next time, I’m writing everything down when we return to the hotel in the evenings. Next time, I may make notes while we’re exploring the sites. It is such a rare opportunity to see these things, I am so very thankful for it, and I don’t want to chance not recalling any of it. This was just the first morning of my first day in Rome. My first evening in Rome was really something special and we’ll get to that next time. Thanks for reading.